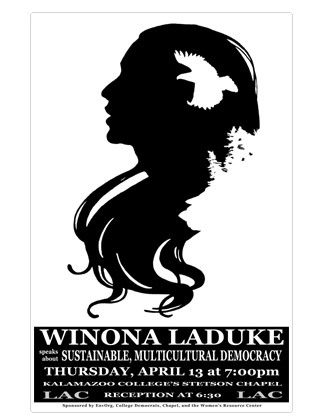 lecture poster Author, activist, and twice vice-presidential running mate for the Green Party, Winona LaDuke delivers powerful speeches to diverse audiences. This custom illustration was applied to a poster and T-shirt to promote a talk she gave at Kalamazoo College. Visit the White Earth Land Recovery Project's website and see some of the amazing things she is up to.